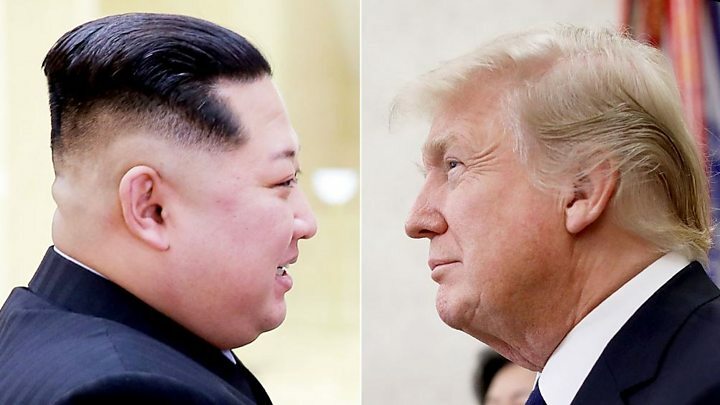 US President Donald Trump will meet North Korean leader Kim Jong-un in Singapore on 12 June, he has said. 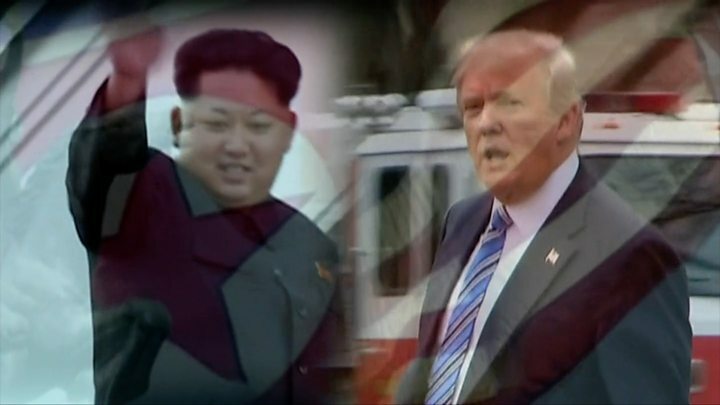 "We will both try to make it a very special moment for World Peace!" the US leader tweeted. In March, Mr Trump stunned the world by accepting an invitation to meet Mr Kim for an unprecedented sit-down. The pair had previously exchanged insults and threats. The breakthrough came after landmark talks between North and South Korea. Mr Trump's announcement came hours after he welcomed home three US detainees released by North Korea. Their release came during a visit to Pyongyang by Secretary of State Mike Pompeo to arrange details of the meeting between Mr Trump and Mr Kim. How does North Korea's Kim Jong-un travel? No sitting US president has ever met a North Korean leader. The White House said the American trio were freed as a gesture of goodwill ahead of the summit, which Mr Trump earlier said he thought would be a "big success". "I really think we have a very good chance of doing something very meaningful," he said. The key issue expected to be discussed is North Korea's nuclear weapons programme - over which Mr Trump and Mr Kim furiously sparred in 2017. The communist North has carried out six nuclear tests since 2006, despite international condemnation and sanctions, saying it needs the weapons for its own security. The US wants Pyongyang to give up its weapons programme completely and irreversibly. Ahead of the meeting, Mr Kim has pledged to stop nuclear tests and intercontinental ballistic missile launches, and also to shut down a nuclear test site. But analysts caution that Mr Kim is unlikely to easily abandon nuclear weapons that he has pushed so hard to obtain, and that "denuclearisation" means something quite different to both sides. There has been no word from Pyongyang on what it might specifically offer at the summit, but key issues for the North will be the presence of 30,000 US military personnel in South Korea, and the lifting of sanctions that are choking the economy. Will historic Koreas summit lead to peace? At a summit in April, Kim Jong-un and South Korean President Moon Jae-in vowed to work to rid the peninsula of nuclear weapons, although the means of achieving this were not detailed and previous such pledges have been abandoned. 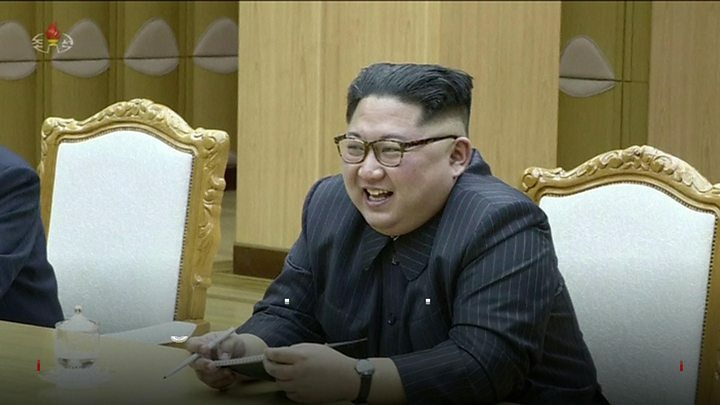 Still, the dramatic meeting - which saw a North Korean leader setting foot on South Korean soil for the first time since the end of the 1953 Korean War - marked a historic breakthrough between the two countries. Singapore, a small and highly prosperous island nation, has been used before for high-profile diplomatic occasions. In 2015, the leaders of China and Taiwan held historic talks in the South East Asian city-state, their first in more than 60 years. It had been seen by top US officials as a good, neutral choice for the Trump-Kim talks. The US and Singapore have a close relationship. Singapore has diplomatic ties with North Korea but suspended all trade with the country in November last year as international sanctions were tightened. Other locations which had been considered for the Trump-Kim summit included Mongolia and the Korean border's demilitarised zone (DMZ). Who are the US detainees?